Anthony Quackenbush is a Miami Negligence Lawyer who handles cases all over the State of Florida. Negligence is defined as a type of behavior which doesn’t live up to the “standard of care” of a reasonable person. That is, people are expected to behave up to the standards of a reasonable person. If they don’t, then they will be responsible for the consequences caused. Negligence is different than crime because crimes require intentional acts. The law calls this intent “mens rea.” Negligence, on the other hand, doesn’t require any intent. It can occur simply as a result of recklessness or carelessness on the part of the negligent person. If somebody intentionally does something wrong, then, he or she can be charged with a crime and prosecuted in court (potentially facing loss of liberty). If somebody does something negligent, on the other hand, then he or she can simply be sued and wind up in a civil courtroom – potentially facing a financial judgment against them (rather than jail, prison or the loss of liberty). This is why there are two justice systems – the criminal justice system and the civil justice system. The criminal justice system judges people who have committed intentional bad acts, while the civil justice system judges people who have committed negligence. If you’ve been the victim of negligence in the State of Florida (including Fort Lauderdale, Broward County, Palm Beach County and West Palm Beach), contact Mr. Quackenbush at 954-448-7288. This Miami Negligence Law Firm can assist you to get compensated for your injuries. Mr. Quackenbush will talk to you about your case for free. The “standard” or “burden of proof” in a negligence/civil case is different than in a criminal case. A “standard” or “burden of proof” is a level that the law sets to establish how much evidence a person or entity bringing a case (i.e., either the State/prosecutor in a criminal case or the plaintiff in a civil case) must provide in order to win/prove his or her case. In a criminal case, the standard or burden of proof is “beyond and to the exclusion of every reasonable doubt.” That is, the prosecutor/the State in a criminal case must provide enough evidence to prove beyond and to the exclusion of every reasonable doubt that the defendant is guilty of the crime charged. If the prosecutor/the State can’t prove this, then the defendant will be acquitted. On the other hand, in a negligence/civil case, the plaintiff (i.e., the injured person) must provide enough evidence to prove that he or she is right by a “preponderance of the evidence/greater weight of the evidence” (i.e., “more likely than not”). That is, the injured person must prove that he or she is right more likely than not (i.e., by 51%). If he or she doesn’t do this, then he or she won’t have met his/her burden and will lose the case. There are different degrees of negligence. If negligence is so bad that it is more than simple carelessness or a mistake, then that negligence will be referred to as “gross negligence” or “willful and wanton” behavior. 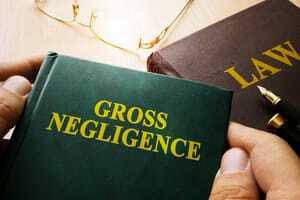 Gross negligence (or intentional behavior) can be punished with punitive damages. Punitive damages are designed to actually punish the wrongdoer. Compensatory damages, on the other hand, are designed to actually compensate the victim for his or her injury/damages. In order to obtain punitive damages, Mr. Quackenbush will have to file a motion on your behalf – asking the Judge in your case to allow you to pursue punitive damages. If you’ve been hurt as a result of somebody else’s negligence in Miami-Dade County (including in Aventura, Coral Gables, Cutler Bay, Doral, Florida City, Hialeah, Hialeah Gardens, Homestead, Key Biscayne, Miami Beach, Miami Gardens, Miami Lakes, North Miami, North Miami Beach, Opa-Locka, Palmetto Bay, Pinecrest, South Miami, and Sunny Isles Beach), call Mr. Quackenbush at 954-448-7288 to talk about your case for free.